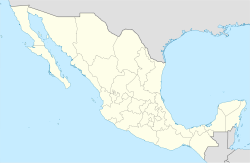 Palizada (Spanish (help·info)) is a city in the Mexican state of Campeche. It is situated in the south-west the state. It serves as the municipal seat for the surrounding municipality of the same name. As of 2010, the Palizada had a population of 3,089. Palizada was named a "Pueblo Mágico" in 2010. ^ "Palizada". Catálogo de Localidades. Secretaría de Desarrollo Social (SEDESOL). Retrieved 23 April 2014.